Like its companion piece "New Enchantment", this tapestry "New Enchantment II" shows a cityscape scene by John Douglas. The works of Douglas focuses on exotic landscapes and cityscapes, and in this tapestry we see a blend of Mediterranean beauty and an exotic feel. 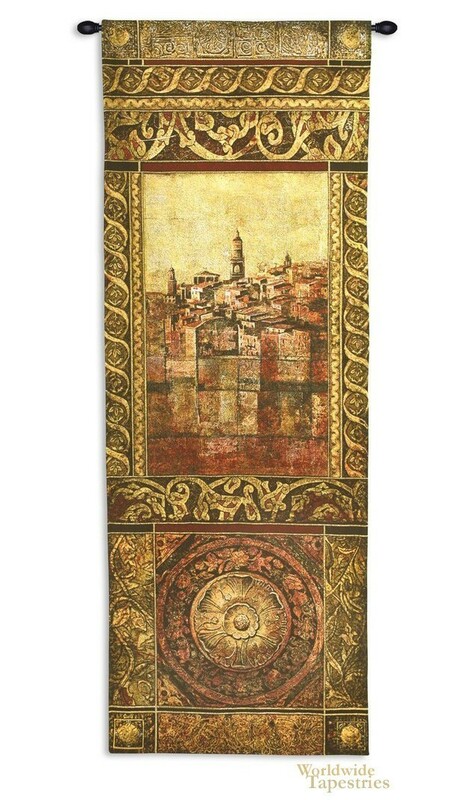 In this tapestry we see the beautiful buildings of this region of Europe in rustic tones which draws the viewer into the scene. The cityscape is accompanied by a luscious border and design of European and Arabian art which evokes this scene as an exotic destination. There is a mystery about this scene as it is a destination of mystery and the story behind this city is up to the imagination of the viewer. This tapestry "New Enchantment II" is backed with a lining and has a tunnel for easy hanging. Note: Tapestry rod and tassels (where pictured) are not included in price.